Codenamed 'Maverick', the Xbox One S All Digital will be Microsoft's first disc-less console. The Redmond-based company will officially unveil the console on April 16, but its launch date has been leaked too along with what games will be included. Prominent leaker Roland Quandt has been at it again. This time he has revealed what looks like the official packaging of the upcoming Xbox One S All Digital along with the date of its announcement and release. The Xbox One S All Digital will have, as the name implies, no disc drive as we have previously speculated. 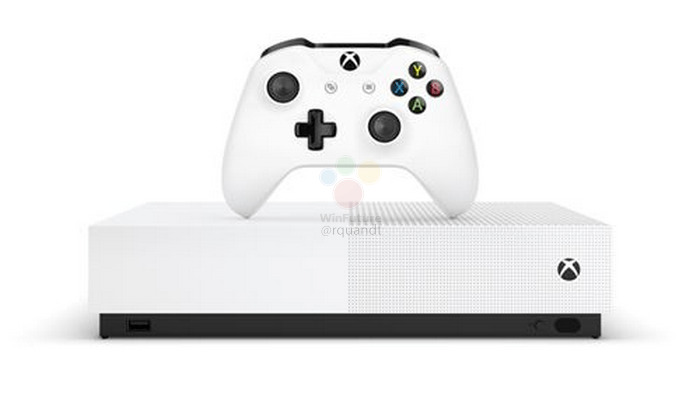 The console is the spitting image of the Xbox One S but with a cleaner design thanks to its lack of a disc drive. Moreover, the All Digital appears to have roughly the same footprint as its sibling too despite housing fewer components. Additionally, the new console will also support HDR gaming in 4K according to the leaked packaging. Hence, we suspect that it will be able to stream content like Netflix in 4K Ultra HD too. The One S All Digital will come with a 1 TB HDD at launch, on which Microsoft will preload Forza Horizon 3, Minecraft and Sea of Thieves. 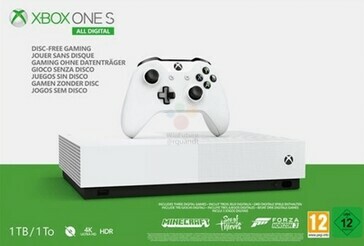 Furthermore, the console will come with one Xbox One S controller as previous Xbox One consoles have. Watch out on April 16, as that is when it looks like Microsoft will officially unveil its first disc-less console. 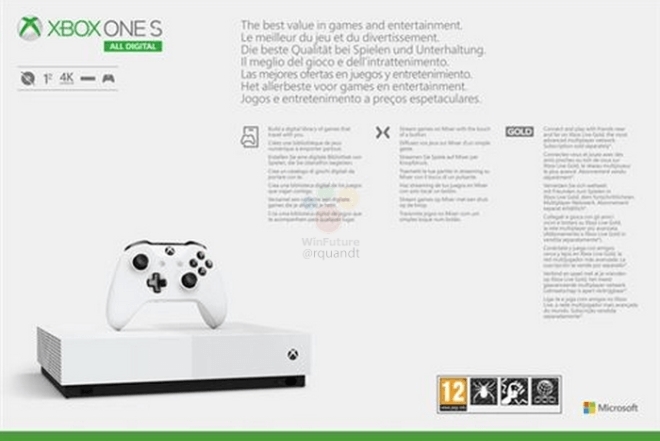 If the rumours are true, then the Xbox One S All Digital will launch at €229.99 (~ US$259.99) on May 7.